When it comes to HIV, there's not always much to be thankful for. But this week has brought an incredible wave of great news: a major discovery that sheds light on the way HIV works, and new hope for prevention. I'm going to focus on the most science-y parts, but I'll try to cover everything. If you're in a hurry, you can skip to the summary diagram at the end. FIRST, an exciting new study that finally answers the question of why immune cells die in HIV. This work was led by Gilad Doitsh in the lab of Warner Greene at the Gladstone Institute of Virology and Immunology. You can find it in the current issue of Cell. The study resolves a long-standing debate in the field. Basically the mystery was this: why do immune cells die in HIV? Death of CD4 T cells is a hallmark of AIDS, but only a small fraction of the dying cells seem to be infected with the virus. The vast majority are apparently "bystanders." So why do these bystander cells die? Doitsh and colleagues discovered that virtually all of these CD4 T cells die by "abortive infection." To understand what this means, here's a reminder of how HIV infection works. (also see the diagram below.) HIV is an RNA virus that enters a cell and is reverse-transcribed to produce DNA, which can then be integrated into the DNA of the host cell. Once this DNA integration occurs, transcription produces new viral RNA that goes on to infect other cells. So this is called a "productive infection" because it produces more HIV. In Doitsh's study, it was found that fewer than 5% of dying immune cells are infected in this way. Instead, the vast majority are abortively infected -- the virus enters the cell but is never integrated into the cell's DNA. 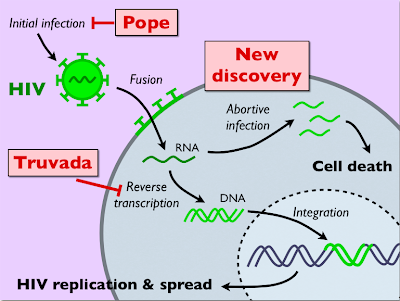 Instead, an impaired reverse transcription process causes buildup of viral transcripts. And the accumulation of these transcripts triggers suicidal cell death. In most circumstances this suicide response would be beneficial, helping to prevent the spread of infections. However, in the case of HIV, the scale of death is much greater (>95% of immune cells). To make matters worse, the dying cells release pro-inflammatory proteins that attract healthy cells to the same site, leading to further infection and death. The end result of this cellular mass suicide is a catastrophic failure of the immune system. The death of immune cells marks the transition from HIV infection to full-blown AIDS. The findings of this study help explain how this happens. They also offer an explanation for the long-standing question of why inflammation and HIV often occur together. These results not only increase our understanding of HIV but also reveal new therapeutic avenues to pursue. More hope for the future! SECOND piece of big news: a pill that can protect against HIV. I have less to say about this because the science behind the drug was already known, and the story was front-page news earlier this week. The results come from a 3-year-long study led by Robert Grant (who also happens to be at the Gladstone Institute) and can be found in the most recent New England Journal of Medicine. To summarize: The goal of the study was to test whether Truvada, an antiretroviral drug already widely used to treat HIV, could also be effective in preventing HIV infection in the first place. Answer: YES. Subjects receiving the drug reduced their risk of infection by 44%. That's a dramatic statistic. And it's even more dramatic if you only consider subjects who faithfully took the pill every day -- they reduced their risk by almost 75%. This is the first time EVER that a pill has proven effective in preventing HIV. Of course the first line of defense is avoiding risky behavior. But in combination with behavioral counseling and education, these medications offer a powerful new weapon for prevention. And let's face it: in the fight against AIDS, we need all the help we can get. LAST but not least, another word about prevention. In addition to the scientific breakthroughs was the news that the pope now approves of condom use for preventing the spread of AIDS. Well, he doesn't exactly approve of condom use. But he states that in terms of making moral decisions, it's a step in the right direction. So it seems the Catholic Church is taking a step in the right direction as well. Also, full disclosure: I work at the Gladstone Institute, where all this exciting research was done. But I've tried to be objective about it. I have to admit that I'm pretty darn proud though. I know Gliad Doitsh! And I'm right downstairs from Robert Grant! And Warner Greene! But not the pope. A facebook friend brought up a question about the second piece of news that I was also wondering: How did the researchers conduct the study to determine the risk of infection with and without the pill? Could you elaborate on the experiment methodology? There are some obvious ethical issues I'd love to hear your take on.